- Wareham's choir since 1947! The choir was formed in 1947, with the Choral Society being established in 1957. In 2007 we celebrated our 60th anniversary. For some recent concerts, you can click on the date to view the concert programme in pdf format, or download it to your own computer by right-clicking and then choosing the Save Link As .. option. (If you don't have Acrobat for viewing pdf files, you can download it from here). Singers in Wareham gathered under the post WW2 Evening Institute arrangements to form a choir. In the Autumn of 1957 a more formal arrangement was established and so began a long association with the schools and churches in Wareham. The printed programmes were sold at 1/- (One Shilling) each! to be performed on 29th March 1958 at Broadway. In the Senior Modern School – Wareham. Mendelssohn - Elijah in Swanage Parish Church, and then with DGS in Salisbury Cathedral. Jan 1985 Harvey Sayles (accompanist) died. Mrs Burton-Page took over. 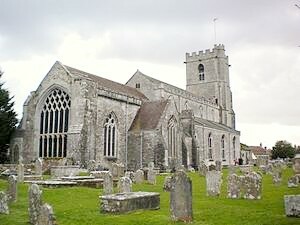 Dec 1986 WCS & SAC Haydn - Mass in D Minor and Carols, in Lady St Mary, Wareham for the first time. Our accompanist Mrs Bridges retires. Mr Dennis Holloway takes over. Handel - Messiah - 250th anniversary of this masterpiece! Robin Longman retires after 33 years as conductor of Wareham Choral Society. Richard Marchant becomes conductor..
Andrew Smetham retires as conductor. Christmas Concert - Joyeux Noel! Christmas Music with a French Theme!